La Mamounia is a hotel etched deep into the history of Marrakech and made more the famous with it's long list of influential guests including the legendary visits of Winston Churchill. I think every article you'll ever read about La Mamounia probably opens with a line similar to that, I probably could have 'cut and paste' instead of spending the last 30 mins trying to challenge my (dis)abilities of literature. Lets get straight to the kitchen where all the action happens. 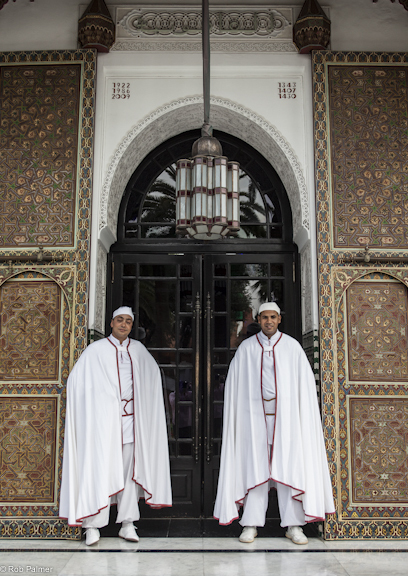 We meet Rachid Agouray, the executive chef at Le Morocain, La Mamounia's Morocaan restaurant (re-read the end of that sentence if French is not your first language). Chef Agouray, born and bred in Marrakech, tells us of his long running relationship with La Mamounia, 25 years now, and of his travels and time overseas training and running world class kitchens and of his love for infusing traditional and modern Moroccan cuisine, I'm getting the feeling that this chef may have just the right balance of spice for any international palette. He can't understand a word of what I'm saying (Chef Agouray does speak English but apparently I don't..), but he still smiles warmly, nods and devotes his full attention to me before looking to Sophia and probably asking in French "what the **** was he on about??". Straight away I can tell that Chef Agouray is a good bloke. 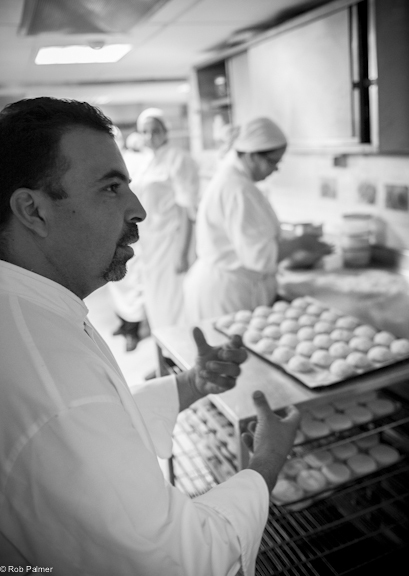 As we walk through the kitchens, cameras rolling, Sophia works her usual magic easily talking to Chef Agouray and translating the French and Arabic to camera. We've all begun to realise how much of a natural she is in front of camera. I walk behind snapping pictures, trying to smoothly enter the conversation with intelligent questions and banging my head on every low extractor fan or ceiling bulkhead until I see the B'stella pastries (warqa) being made, here's my chance for some camera time! If you've ever seen this done before it's amazing. They grab a ball of the dough, flick it round in their hands like a yo-yo and then lightly dab it across a hot plate before flaking off an ultra thin pastry in the shape of a pancake, easy! 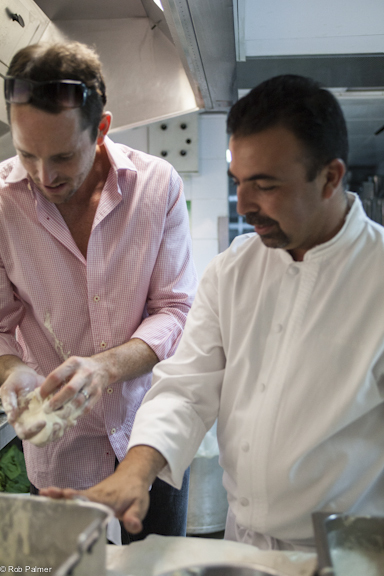 Before heading out into the beautiful light drench tiled courtyard to shoot the finished dishes and recipes Chef Agouray has supplied us for our book, he takes me to the sink and kindly helps me wash the splatters of dough from my best shirt. Then dab it on the hot plate. Rachid inspects my first attempt. One dirty shirt, one clean one. A grand hotel with a grand entrance.